We have expertise in manufacturing & exporting a broad array of E1W cable glands which is designed with 2 part amour or earth lock. Further, these are also enabled with inner and outer displacement and provide seals on to both inner sheath and outer sheath of the cable. We offer these cables at most affordable price. The range of EIW cable glands which we derive is used with all types of SWA extruded bedding cable where it is essential to produce IP 66 seal on to the outer sheath. These equipment also help us in producing an IP 66 or explosion proof seal on inner sheath. It provides seals on to both inner sheath and outer sheath of the cable. These are also applied to all kinds of SWA extruded bedding cables. Rated at IP 66 in conjunction with entry thread seal. 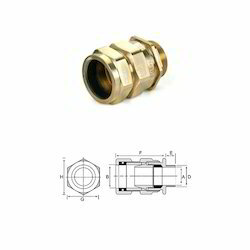 Looking for Cable Gland E1W ?